Some signal transduction pathways regulate the transcription of RNA. Others regulate the translation of proteins from mRNA. An example of a protein that regulates translation in the nucleus is the MAP kinase ERK. The MAPK/ERK pathway (also known as the Ras-Raf-MEK-ERK pathway) is a chain of proteins in the cell that communicates a signal from a receptor on the surface of the cell to the nuclear DNA. 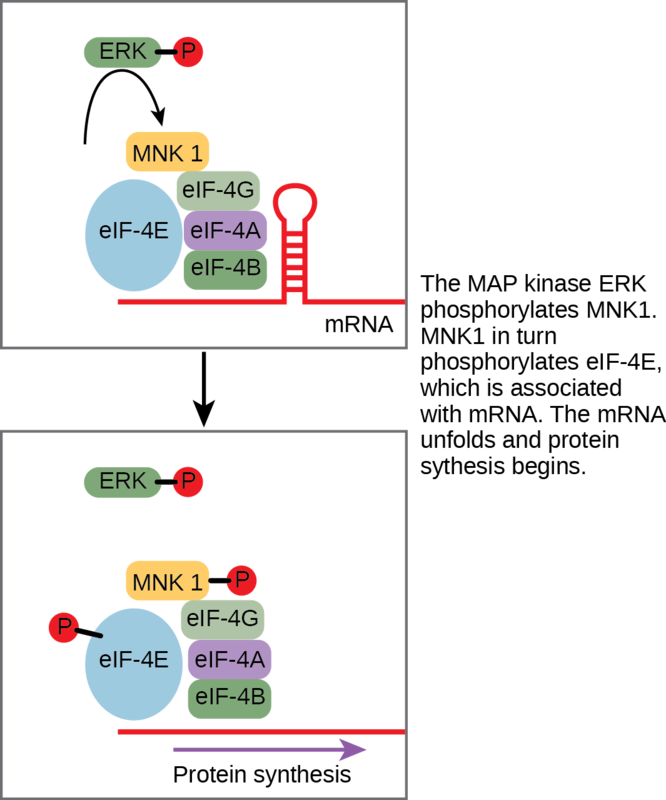 ERK is activated in a phosphorylation cascade when epidermal growth factor (EGF) binds the EGF receptor (see (Figure)). Upon phosphorylation, ERK enters the nucleus and activates a protein kinase that, in turn, regulates protein translation ((Figure)). Another mechanism of gene regulation involves PKC, which can interact with is a protein that acts as an inhibitor. An inhibitor is a molecule that binds to a protein and prevents it from functioning or reduces its function. In this case, the inhibitor is a protein called Iκ-B, which binds to the regulatory protein NF-κB. (The symbol κ represents the Greek letter kappa.) When Iκ-B is bound to NF-κB, the complex cannot enter the nucleus of the cell, but when Iκ-B is phosphorylated by PKC, it can no longer bind NF-κB, and NF-κB (a transcription factor) can enter the nucleus and initiate RNA transcription. In this case, the effect of phosphorylation is to inactivate an inhibitor and thereby activate the process of transcription. The result of another signaling pathway affects muscle cells. The activation of β-adrenergic receptors in muscle cells by adrenaline leads to an increase in cyclic AMP (cAMP) inside the cell. Also known as epinephrine, adrenaline is a hormone (produced by the adrenal gland located on top of the kidney) that readies the body for short-term emergencies. Cyclic AMP activates PKA (protein kinase A), which in turn phosphorylates two enzymes. The first enzyme promotes the degradation of glycogen by activating intermediate glycogen phosphorylase kinase (GPK) that in turn activates glycogen phosphorylase (GP) that catabolizes glycogen into its constituent glucose monomers. (Recall that your body converts excess glucose to glycogen for short-term storage. When energy is needed, glycogen is quickly reconverted to glucose.) Phosphorylation of the second enzyme, glycogen synthase (GS), inhibits its ability to form glycogen from glucose. In this manner, a muscle cell obtains a ready pool of glucose by activating its formation via glycogen degradation and by inhibiting the use of glucose to form glycogen, thus preventing a futile cycle of glycogen degradation and synthesis. The glucose is then available for use by the muscle cell in response to a sudden surge of adrenaline—the “fight or flight” reflex. Cell signaling pathways also play a major role in cell division. Cells do not normally divide unless they are stimulated by signals from other cells. The ligands that promote cell growth are called growth factors. Most growth factors bind to cell-surface receptors that are linked to tyrosine kinases. These cell-surface receptors are called receptor tyrosine kinases (RTKs). Activation of RTKs initiates a signaling pathway that includes a G-protein called RAS, which activates the MAP kinase pathway described earlier. The enzyme MAP kinase then stimulates the expression of proteins that interact with other cellular components to initiate cell division. Cancer BiologistCancer biologists study the molecular origins of cancer with the goal of developing new prevention methods and treatment strategies that will inhibit the growth of tumors without harming the normal cells of the body. As mentioned earlier, signaling pathways control cell growth. These signaling pathways are controlled by signaling proteins, which are, in turn, expressed by genes. Mutations in these genes can result in malfunctioning signaling proteins. This prevents the cell from regulating its cell cycle, triggering unrestricted cell division and perhaps cancer. The genes that regulate the signaling proteins are one type of oncogene, which is a gene that has the potential to cause cancer. The gene encoding RAS is an oncogene that was originally discovered when mutations in the RAS protein were linked to cancer. Further studies have indicated that 30 percent of cancer cells have a mutation in the RAS gene that leads to uncontrolled growth. If left unchecked, uncontrolled cell division can lead to tumor formation and metastasis, the growth of cancer cells in new locations in the body. Cancer biologists have been able to identify many other oncogenes that contribute to the development of cancer. For example, HER2 is a cell-surface receptor that is present in excessive amounts in 20 percent of human breast cancers. Cancer biologists realized that gene duplication led to HER2 overexpression in 25 percent of breast cancer patients and developed a drug called Herceptin (trastuzumab). Herceptin is a monoclonal antibody that targets HER2 for removal by the immune system. Herceptin therapy helps to control signaling through HER2. The use of Herceptin in combination with chemotherapy has helped to increase the overall survival rate of patients with metastatic breast cancer. More information on cancer biology research can be found at the National Cancer Institute website (https://www.cancer.gov/research/areas/biology). When a cell is damaged, superfluous, or potentially dangerous to an organism, a cell can initiate a mechanism to trigger programmed cell death, or apoptosis. Apoptosis allows a cell to die in a controlled manner that prevents the release of potentially damaging molecules from inside the cell. There are many internal checkpoints that monitor a cell’s health; if abnormalities are observed, a cell can spontaneously initiate the process of apoptosis. However, in some cases, such as a viral infection or uncontrolled cell division due to cancer, the cell’s normal checks and balances fail. External signaling can also initiate apoptosis. For example, most normal animal cells have receptors that interact with the extracellular matrix, a network of glycoproteins that provides structural support for cells in an organism. The binding of cellular receptors to the extracellular matrix initiates a signaling cascade within the cell. However, if the cell moves away from the extracellular matrix, the signaling ceases, and the cell undergoes apoptosis. This system keeps cells from traveling through the body and proliferating out of control, as happens with tumor cells that metastasize. Apoptosis is also essential for normal embryological development. 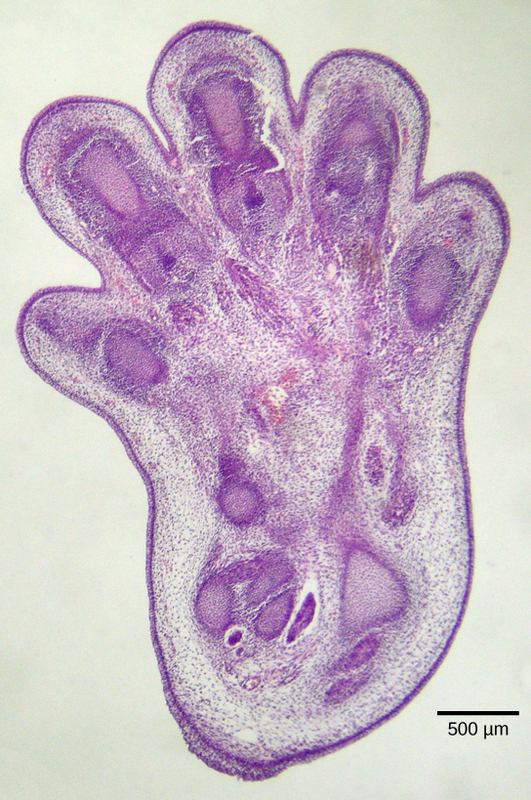 In vertebrates, for example, early stages of development include the formation of web-like tissue between individual fingers and toes ((Figure)). During the course of normal development, these unneeded cells must be eliminated, enabling fully separated fingers and toes to form. A cell signaling mechanism triggers apoptosis, which destroys the cells between the developing digits. Inside the cell, many different enzymes reverse the cellular modifications that result from signaling cascades. For example, phosphatases are enzymes that remove the phosphate group attached to proteins by kinases in a process called dephosphorylation. Cyclic AMP (cAMP) is degraded into AMP by phosphodiesterase, and the release of calcium stores is reversed by the Ca2+ pumps that are located in the external and internal membranes of the cell. What is the function of a phosphatase? A phosphatase removes phosphorylated amino acids from proteins. A phosphatase removes the phosphate group from phosphorylated amino acid residues in a protein. A phosphatase phosphorylates serine, threonine, and tyrosine residues. A phosphatase degrades second messengers in the cell. How does NF-κB induce gene expression? A small, hydrophobic ligand binds to NF-κB, activating it. Phosphorylation of the inhibitor Iκ-B dissociates the complex between it and NF-κB, and allows NF-κB to enter the nucleus and stimulate transcription. NF-κB is phosphorylated and is then free to enter the nucleus and bind DNA. NF-κB is a kinase that phosphorylates a transcription factor that binds DNA and promotes protein production. Apoptosis can occur in a cell when the cell is ________________. What is the effect of an inhibitor binding an enzyme? The complex is transported out of the cell. How does PKC’s signaling role change in response to growth factor signaling versus an immune response? PKC interacts directly with signaling molecules in both cascades, but only exhibits kinase activity during growth factor signaling. PKC interacts directly with signaling molecules in growth factor cascades, but interacts with signaling inhibitors during immune signaling. PKC amplifies growth factor cascades, but turns off immune cascades. PKC is activated during growth factor cascades, but is inactivated during immune response cascades. A scientist notices that a cancer cell line fails to die when he adds an inducer of apoptosis to his culture of cells. Which hypothesis could explain why the cells fail to die? The cells have a mutation that prevents the initiation of apoptosis signaling. The cells have lost expression of the receptor for the apoptosis-inducing ligand. The cells overexpress a growth factor pathway that inhibits apoptosis. What is a possible result of a mutation in a kinase that controls a pathway that stimulates cell growth? If a kinase is mutated so that it is always activated, it will continuously signal through the pathway and lead to uncontrolled growth and possibly cancer. If a kinase is mutated so that it cannot function, the cell will not respond to ligand binding. How does the extracellular matrix control the growth of cells? Receptors on the cell surface must be in contact with the extracellular matrix in order to receive positive signals that allow the cell to live. If the receptors are not activated by binding, the cell will undergo apoptosis. This ensures that cells are in the correct place in the body and helps to prevent invasive cell growth as occurs in metastasis in cancer. A scientist notices that a cancer cell line shows high levels of phosphorylated ERK in the absence of EGF. What are two possible explanations for the increase in phosphorylated ERK? Be specific in which proteins are involved. An upstream mutation (in Ras, Raf, MEK) constitutively activates the signaling cascade. ERK has a mutation that prevents it from binding to its phosphatase. The cell has a mutation preventing the expression or function of the ERK-specific phosphatase. Response to the Signal by OpenStax Biology 2nd Edition is licensed under a Creative Commons Attribution 4.0 International License, except where otherwise noted.